A seemingly innocuous housesitting gig takes a series of sinister turns. Director Dave Parker understands the interplay between light and shadow, and the significance of barely glimpsed scares; the horror works, though only in very small doses. Recovering from a recent car accident, Andre’s friend Robert suggests he take up a housesitting job for him over the weekend. Over the course of just one night in the secluded Los Angeles Hills home, Andre will discover secrets about his life, the house and himself. Is he really in the house alone? This is a difficult film to review as the points I most want to discuss are major spoilers; yes, it's one of those films, a psychological horror with a twist in the tail that you either A. See from a mile away, as I did, or B. Enjoy the slow reveal the movie obviously wants you to experience. To this end I’ll refrain from offering any real insights into the ending except to discuss it in abstract. This film is essentially a one-man show. At the beginning we meet Andre (Ivan Djurovic), introduced through his relationship with Robert (Rick Irwin), who expresses concern for his injured friend, who is struggling to remember the details of his recent car accident and is nursing a wrist guard and some fragile post-accident feelings. They touch on the fact that Andre used to be quite the ladies man, and hint at a long friendship between the two. Once Robert leaves, a sizable chunk of the film is now preoccupied with a detailed tour of the home, as Andre discovers it while carrying about a camcorder, ostensibly a ‘video greeting’ for his grandmother. After making much of the alcoholic and cannabinoid delights on hand, Ivan invites his squeeze Rachel (Sanny van Heteren) over for dinner (Netflix and Chill from all indications). This is when things start to go awry and stay that way until the end of the movie. A very creepy neighbor (James Duval of Donnie Darko fame) comes to the door and insinuates his way inside, claiming he is warning Ivan of a group of “escaped convicts” in the area (not sure anyone even says ‘convicts’, but ok). Rachel disappears after a very uncomfortable scene with said neighbour; Ivan gets stoned and becomes a most unreliable narrator, so when things start to go bump in the night we can’t wholly trust what we are seeing or hearing. Things escalate nicely until we reach a rushed ending that offers little surprise and could’ve been handled better, but luckily does not undo the previous good work. 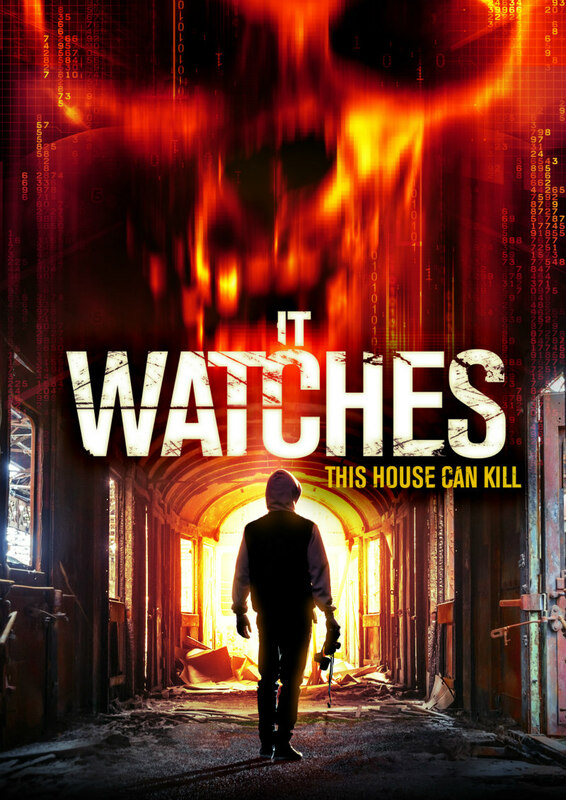 It Watches was originally shot in 2012 under the title Coldwater; this film has had a long wait for distribution but fortunately it does not appear dated in any way. The swap between camcorder footage and regular film is useful to keep the viewer engaged. Some of the set-ups are wonderfully shot for maximum creep factor. Sound is employed to good effect, and the importance of that cannot go understated. The house itself is obviously integral to the plot, and here the filmmakers have chosen wisely – the odd trinkets (mannequins!! ), strange angles and interestingly placed windows are intriguing, while the modern conveniences and bland walls add nice contrast. The performances are all well above expected, with Djurovic a stand out as Andre. His presence and versatility make him someone to watch for in the future; he is convincing the whole way through. Unfortunately, the script by Djurovic and Parker is just not as clever or as disturbing as it could have been. Though the journey to get there is a solid and at times pulse-raising one, the ending is mishandled with the ‘big twist’ given away in an earlier scene that stood out like a sore thumb. I did like this film - the things it got right were very right; but the ending of any film (horror in particular) is so important, and to see this one stumble at the last hurdle was a shame. It was good, but it could’ve been great. It Watches is on VOD December 6th.